An article over at Discover Magazine reported on a study of flightless bird evolution. And if you’ve ever taken a close look at some of these flightless birds- such as the ostrich- you’ve probably noticed how funny and strange they look. Now some researchers are trying to learn more about the history of these ridiculous-looking birds and where they came from. Birds such as ostriches, emus, rheas, kiwis and cassowary’s are known as ratites- a group of mostly large, flightless birds that have no keel on their sternum to anchor their wing muscles. Other ratites, such as the giant moa and elephant bird, are now extinct. Scientists have never really figured out the evolutionary tree of ratites, but some believe they’re distant cousins of the tinamou- a flying bird that lives in Mexico and Central and South America. It was assumed that some kind of flightless bird evolved from the tinamou, and that the ratites evolved from this flightless bird. But now they propose a different evolutionary relationship based on genetic studies. 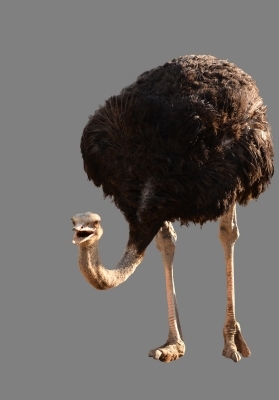 It’s theorized that, as the continents drifted apart, a hypothetical flightless bird evolved into emus, ostriches, moa, and other species of ratites as they became isolated from each other. But one of the problems with this is that, while some evidence supports such a scenario, other evidence contradicts it. Therefore researchers analyzed DNA from the extinct moa and compared it to the emu and ostrich. And they found that the ratites didn’t evolve from the tinamou, but are now assumed to have evolved from a different flying bird alongside the tinamou, which simply retained its ability to fly. Somewhere along the line each of the different ratites split off from the hypothetical flying bird and independently lost the ability to fly; such scenarios where organisms develop similar traits independently is known as convergent evolution, and this concept presents problems for the evolutionist. Evolution is supposed to be random and unguided. But if animals are evolving the same traits independently, then there’s nothing random or unguided about it. What makes this admission so intriguing is that, in order to be an evolutionist, one must believe that flightless organisms, such as dinosaurs, evolved feathers, wings, and the ability to fly. But then they go on to acknowledge that it’s really hard for an organism that already has feathers and wings to fly once it has lost the ability to do so. In fact it’s so hard that there are no known examples. Yet, in order to maintain their belief in evolution, they must also admit that, technically speaking, it’s possible for these flightless birds to re-evolve the ability to fly, even though that has never happened. The article also made the mistake of implying that genetic evidence speaks for itself rather than it being the scientists who arrives at a particular conclusion based on the evidence. The evidence doesn’t tell us that ratites came from flying ancestors; rather it’s the authors of the study who came to that conclusion based on their interpretation of the evidence- and they could very well be wrong. Something else that caught my attention was the two jabs the author of the article took at humans, who are the villains. The article made it a point to blame humans for the extinction of the moa and elephant bird, even though there’s no conclusive evidence that this is the case. It seems as though man has been indicted. What I’ve concluded from this article is that no one who believes in evolution really knows what type of relationship these birds have to each other; they can only speculate about what happened in the past, and that’s one of the weaknesses of historical or forensic science. Creationists know that some birds are related to each other, but a lot of times we can’t determine how they’re related simply based on similarities, whether those similarities are based on genetics or morphology. Creationists understand that similarity doesn’t equal relationship. Evolutionists, however, must believe that similarities imply relationship, even if that’s not the case. Creationists believe we can have a better understanding of their relationship based on their ability to reproduce with one another; such studies are known as baraminology. Evolutionists try to make the case that there’s so much overwhelming evidence in favor of evolution that it’s absurd to believe otherwise, but this article is steeped in uncertainty and assumptions, which should lead us to conclude that the case for evolution isn’t very strong at all. The article admits that ratite evolution has always been contentious, uncertain, contradictory, based on guesswork and speculation, is open to suggestion and interpretation, and doesn’t have any observational evidence to support it. Evolutionists aren’t even troubled by the failures of previous studies that led them down the wrong path. Instead they just evolve their line of reasoning to create a new story. Evolution, therefore, becomes so elastic that it’s meaningless. Creationists, however, don’t have a problem if it turns out that ratites are descended from a type of bird that flew. We understand that organisms can lose function, but that doesn’t mean organisms can evolve a function that doesn’t exist within its genome. No, we maintain that flying birds did not evolve from a non-flying ancestor, and such a stance is better supported by the evidence than the evolutionary belief to the contrary.